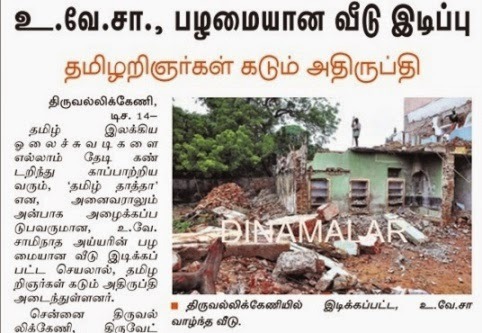 "Sampath Speaking" - the thoughts of an Insurer from Thiruvallikkeni: Tamil Thatha Sri U Ve Saminatha Iyer house demolished ! Tamil Thatha Sri U Ve Saminatha Iyer house demolished ! Time and tide wait for none ~ (unless authorities interrupt) is what this Dec 2014 has made Tamil World to remember. Thiruvallikkeni aka Triplicane is a famed land… The name Tiruvallikeni by natural laws of linguistics, was crudely rolled and twisted out of shape by the English tongue as Triplicane. It is a place where religion, nationalistic fervour, patriotism, sports, education and the individual dignity have interspersed for the benefit of the State and the larger interests of the Nation. Triplicane was the seat of freedom struggle – as also Tamil literature. The patriarch of Tamil language – Shri U Ve Swaminatha Iyer taught at Presidency college and lived in Triplicane. It is natural that one is deeply attached to their mother tongue – perhaps We, tamilians have more sentimental attachment than others… we felt proud and happy when the great time-old language was declared as ‘Classical language’ in 2004. On the famous Marina beach dots the statues of various Tamil literary giants including- Kamban, Ilango adigal, Thiruvalluvar, Bharathiyar, Avvaiyar – and on the opposite there is the statue of this man, who did yeoman service to the language. Interestingly, the original texts of a significant number of the much-acclaimed literary works of the Sangam period came to public notice only towards the end of the 19th century, when they appeared in print with commentaries. Until then, works such as the Aymperum Kaappiangal (the five great epics) - Silappathikaram, Manimekalai, Kundalakesi, Jeevaka Chintamani and Valaiyapathi, were in the form of palm leaf manuscripts in the possession of scores of families living in various parts of Tamil Nadu. Only very few had the skill to read them, and, therefore, did not realise their literary worth. Some great people took upon themselves the need for hunting the rare palm leaf manuscripts and bring to light the hidden treasure of Tamil literature. 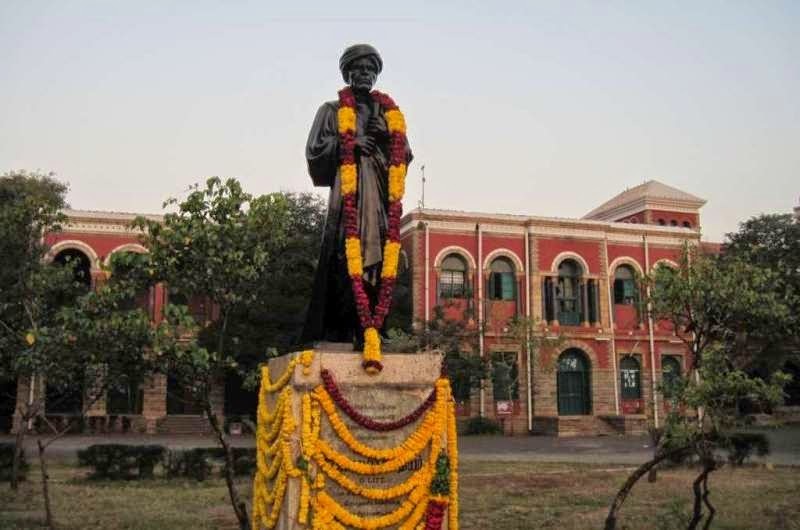 Foremost among those who undertook this formidable task was Mahamahopadhyaya Dakshinathya Kalanidhi Uthamadhanapuram Venkatasubbaiyer Swaminatha Iyer (1855-1942), popularly known as "Tamizh thaththaa" (the grand old man of Tamil). History has it that Rabindranath Tagore once visited Madras as a guest of T.S. Ramaswami Aiyar, a famous Madras lawyer at which time, he was informed of the works of Tamil literary giant. The Bengali poet, who was also interested in printing palm leaf manuscript, was excited and expressed his willingness to meet him. The man who gave us the National Anthem met him at his residence here at Thiruvatteswaranpet. In Sept. 2012, I had posted about that house coming under the hammer. U.Ve.Sa, the Tamil scholar and researcher instrumental in bringing many long-forgotten works of classical Tamil literature to light, was born in the village of Suriaymoolai near Kumbakonam. His contributions to Tamil music are very significant – he published Silapathigaram, Pathupattu, Ettuthogai and more. His autobiography, En Sarithiram, was serialised in the Tamil weekly Ananda Vikatan, from January 1940 to May 1942. His house at Uthamadhanapuram near Papanasam in Tiruvarur district was converted into a memorial. 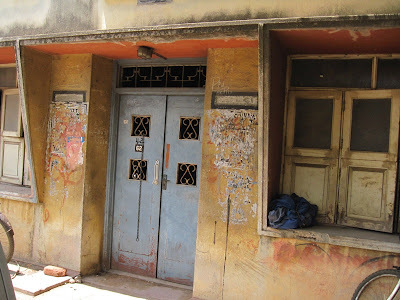 But the house he lived in at Thiruvatteeswaranpet in Chennai and from where he prepared many works for publication was lying derelict, as his descendants have moved away. The house reportedly has changed hands over the period of time, and in Sept. 2012, the inner portions were demolished. Thyagaraja Vilas, the house of the grand old man of Tamil literature had only the façade, even as concerned public were trying to stall it and have a memorial of Tamizh Thatha there. They expected the Govt. to intervene and secure the house of Swaminatha Iyer, converting it into a memorial for the posterity. Alas, nothing of that sort happened !! Dinamalar, 14th Dec 2014 issue carries a photo and article that the façade is broken and walls have fallen – taking away the reminiscence of the great Tamil scholar.